To build a new future, we must understand our recent past and the present. Let’s begin with the objective situation of the unions today. American labor union membership is at its lowest point since the 1920s, and a number of bills before Congress and state legislatures, as well as cases in the courts, suggest that in the next few years labor unions will face the possibility of virtual extinction. In 2016 the United States had 14.6 million union members, representing only 10.7 percent of all U.S. workers, while in 1983 there were 17.7 million unionized workers, or 20.1 percent of the labor force. Back in the mid-1950s, 35 percent of workers belonged to labor unions. Among public-sector workers, today 34.4 percent are unionized, compared to only 6.4 percent in the private sector.1 Most workers have never been involved in a strike, never attended a union meeting, and in the recent Teamster election for top officers, only 19 percent of members voted in a mail-ballot election. To many workers, unions have ceased to seem relevant. Despite some highly publicized organizing efforts, for example among autoworkers in the South, labor has been unable to turn the tide. The United Auto Workers campaigns at Volkswagen and Nissan lost; the staff organizers failed to build a real union on the shop floor, and so workers never became confident that they could win without risking their jobs.2 In addition to the regular labor unions, there are dozens of workers centers in the United States that bring together immigrant workers, most of them Latinos and many of them undocumented, into organizations to help protect their labor rights and to improve their working conditions.3 While these organizations have thousands of members and do very important work, they do not have anything like the weight and strength of the labor unions. Not only are there fewer organized workers than at any time in almost a hundred years, but unions also conduct many fewer strikes. In 2016, there were only 15 major work stoppages involving a total 99,000 workers. Over the past four decades major work stoppages declined by approximately 90 percent. The period from 2007 to 2016 was the decade with fewest strikes, averaging approximately 14 major work stoppages per year. The lowest annual number of major strikes was five in 2009.4 While a few major strikes have inspired the labor movement and provided models of organization, strategy, and struggle, such as the Chicago Teachers Union strike of 2012 and the Communications Workers strike of 2016, there has been no major strike wave in the United States since 1970-1971. In the last decade, U.S. labor unions have adopted some new organizing strategies among groups of low-wage workers. The most salient of these campaigns has been the “Fight for $15,” backed by unions such as the Service Employees International Union and the United Food and Commercial Workers. The protest demonstrations, local symbolic actions, and occasional small-scale strikes combined with lobbying and legislation have won workers an estimated $62 billion in raises over the last decade, according to a report by the National Employment Law Project.5 This is all well and good, though wages remain too low. And, most important, the campaign has failed to organize the hundreds of thousands of low-wage workers in the fast-food, hospitality, and retail sectors. Meanwhile, state legislatures continue to pass new right-to-work laws. For many years, right-to-work laws existed only in the states of the Deep South and a couple of the Great Plains states. But in 2012, Michigan and Indiana passed right-to-work bills, followed by Wisconsin in 2015 and West Virginia in 2016. Then in January 2017, Kentucky adopted right-to-work, and in February 2017, Missouri became the 28th state to pass right-to-work.10 Where right-to-work laws are passed, unions lose members and their dues base, face staff reductions, and have less economic power and political clout. Even without court decisions or new legislation, Trump has moved to reduce the power of unions by nominating two longtime union opponents to the National Labor Relations Board, which oversees union representation and collective bargaining in the private sector. Trump’s two appointees, William Emanuel and Marvin Kaplan, now confirmed by the Senate, will give Republicans a majority on the five-member board and tremendous power to block union organization and representation.11 Peter Robb, who will become NLRB General Counsel, is known for his anti-union positions and will have the power to influence thousands of labor cases.12 The board has the power to decide who in the workplace gets to vote for a union, how unions and management conduct themselves during an election, and how and when union elections will take place. Donald Trump ran for president on a nativist, nationalist economic platform, promising to “Make America Great Again” by both encouraging job production and defending those jobs against both foreign capital and foreign workers. Trump promised to rebuild the national infrastructure and to pressure companies to keep industrial jobs in the United States or return them. He pledged to protect those jobs from Mexicans and other “illegal immigrants” as well as to protect the United States from economic competition from China. Trump vowed that while doing those things he would save Social Security and Medicare. Finally, Trump swore to end America’s foreign wars and the U.S. policy of regime change in foreign countries, concentrating on putting “America First.” Trump went so far as to claim that he would make the Republican Party “a workers party.”14 It was this nationalist economic platform that in a few key states won Trump just enough white working-class voters to carry the Electoral College vote and win the election. Trump also claimed to be a friend of the coal industry and of coal miners. Once elected he made good on promises to eliminate any restrictions on coal production. Speaking on October 9 in eastern Kentucky, in coal country, Scott Pruitt, head of the Environmental Protection Agency, announced to the cheers of coal company executives that “the war on coal is over” and that his agency was doing away with Obama’s Clean Power Plan, which had been adopted to protect both the environment and human health.18 But Trump and Pruitt may not be able to deliver on the promises of more coal jobs: Many companies have already switched to wind, solar, or natural gas. Still, fuel-burning plants—whether coal or gas—continue to contribute to climate change, to harm children, and to worsen health problems such as asthma. And the coal production they support is dangerous to the planet and all of its inhabitants, not only producing global warning, but also causing more extreme weather. Pruitt’s announcement came just after hurricanes Harvey, Irma, Maria, and Nate struck Texas, Louisiana, Florida, and Puerto Rico in an unprecedented storm season that some scientists believe was caused by climate change. But, though not many coal jobs may be created, in the very short run Trump’s promise to bring back jobs in coal is a problem for AFL-CIO President Richard Trumka in his own home base, the United Mine Workers. The idea of the rank and file strategy had its origins in the Communist Party’s Trade Union Education League of the early 1920s and in the best practices of the Trotskyists in the Teamsters union in the 1930s. It was also inspired by the many rank and file rebellions in U.S. labor unions beginning in the mid-1960s and continuing until 1981, when a combination of economic recessions and political repression broke the movements. In that period, miners, autoworkers, truck drivers, postal workers, farm workers, and others rebelled against their union leaderships, their employers, and sometimes the government.21 Leftists played a role in many of these movements. The International Socialists’ work in the Teamsters union, where it helped to bring together younger radicals and longtime dissidents to found Teamsters for a Democratic Union in 1976, represented the most successful of the rank and file rebellions of that era.22 With TDU’s support, in 1991 Ron Carey was elected president of the Teamsters union, and under his leadership the union conducted a national strike against United Parcel Service in 1997 that was an inspiration for the union movement.23 The rank and file strategy remains valid and necessary if not sufficient to build a new workers movement. Labor Notes, which publishes a monthly newspaper, distributes books such as the Troublemaker’s Handbook, holds Troublemaker’s Schools around the country, and hosts a biannual conference attended by as many as 2,000 activists, remains an active center for rank-and-file activism. Most workers, however—some 90 percent of them—are not in unions, so we need new strategies for union organizing. Some workplaces, for example in the logistics industry, that is warehousing and shipping, still have the character of traditional industrial workplaces. That is, there are large numbers of semi-skilled workers organized around facilities and machines—in this case shelving, order pickers, forklifts, docks, and trucks—and gathered together in large numbers in one plant or a constellation of facilities. For example, Amazon, a corporation worth $386 billion, has 350,000 workers. The Fall River facility outside of Boston employs 1,000 warehouse workers. While up to now, efforts to unionize Amazon have failed,24 workers like these can be organized in the same way industrial workers have always been organized, by building a core of clandestine organizers in the workplaces and tying them together across the country with a labor union. Large retailers like Wal-Mart, which has 2.1 million employees, many of them warehouse workers, could be organized in the same manner. A great deal of attention has been dedicated to discussions of the difficulty of organizing the “precariat,” that is, contingent workers without regular full-time jobs.26 Over the last several decades, the workplace became “fissured,” as one authority puts it.27 Many employers in a variety of industries contracted out all but the essential productive and moneymaking elements of their businesses to other companies, often non-union. These companies in turn often hired seasonal, temporary, or part-time workers. Other employers in the hospitality and restaurant industries also hired contingent workers. Even where workers hold some sort of supposedly full-time or permanent status, they perceive their positions as being insecure.28 Today millions of young people, many of them with college debts amounting to tens of thousands of dollars, cannot find jobs in the fields for which they prepared themselves and have only the most precarious employment. Organizing these workers, many of whom work two or three jobs, will require new strategies and tactics, but the organizing must be done one way or another. The organization of the unorganized must be high on the agenda of a new labor movement and of socialists. 1. U.S. Bureau of Labor Statistics, “Union Members Summary,” Jan. 27, 2017. 2. Chris Brooks, “Why Did Nissan Workers Vote No?” Labor Notes, Aug. 11, 2017, 3. Janice Fine, “Worker Centers: Organizing Communities at the Edge of the Dream,” Economic Policy Institute, www.epi.org/publication/bp159/. 4. U.S. Bureau of Labor Statistics, “Work Stoppages Summary,” Feb. 9, 2017. 5. National Employment Law Project, “Fight for $15’s Four-Year Impact: $62 Billion in Raises for America’s Workers.” A link to the full report is available at the website. 6. Josh Eidelson, “Unions Are Losing Their Decades-Long ‘Right-to-Work’ Fight,” Bloomberg Businessweek, Feb. 16, 2017. 7. Ian Millhiser, “Springtime for Union Busting?” The Nation, June 26, 2017. 8. Garen E. Dodge and Anna M. Stancu, “Congress Considers National Right-to-Work Bill: Beginning of the End for Unions?” The National Law Review, Feb. 8, 2017. 9. Dodge and Stancu, Ibid. 10. nwLaborPress.org, “Another State Goes Right-to-Work – Missouri,” Feb. 14, 2017. 11. Noah Lanard, “Trump’s Labor Board Appointments Are Another Blow for Unions,” Mother Jones, July 19, 2017. 12. Mike Scarcella and Erin Mulvaney, “Peter Robb, Trump’s Pick for NLRB General Counsel, Is Poised to Pivot Board,” Corporate Counsel: Inside Counsel, Sept. 19, 2017. 14. Nick Gass, “Trump: GOP Will Become ‘Worker’s Party’ Under Me,” Politico, May 26, 2016. 15. Alicia Parlapiano and Gregor Aisch, “Who Wins and Loses in Trump’s Proposed Budget,” New York Times, March 16, 2016,. 16. Sharon LaFraniere and Alan Rappeport, “Popular Domestic Programs Face Ax Under First Trump Budget,” New York Times, Feb. 17, 2017 and Aaron Blake, “The 19 Agencies that Trump’s Budget Would Kill, Explained,” The Washington Post, March 16, 2016,. 17. Tracy Jan and Steven Mufson, “If You’re a Poor Person in America, Trump’s Budget Is Not for You,” The Washington Post, March 16, 2016. 20. Kim Moody, “The Rank and File Strategy,” in Kim Moody, In Solidarity: Essays on Working Class Organization in the United States (Chicago: Haymarket Books, 2014), 114. A version of this essay can also be found online here. 21. Aaron Brenner, Robert Brenner, and Cal Winslow, eds, Rebel Rank and File: Labor Militancy and Revolt from Below During the Long 1970s (New York: Verso, 2010). 22. Dan La Botz, “The Tumultuous Teamsters of the 1970s,” in Aaron Brenner, Robert Brenner, and Cal Winslow. And Dan La Botz, Rank-and-File Rebellion: Teamsters for a Democratic Union (New York: Verso, 1990). 23. Dan La Botz, The Fight at UPS: The Teamsters Victory and the Future of the “New Labor Movement,” (Solidarity, 1997). Unfortunately, a few months later the U.S. government removed Carey from office because of corruption by underlings in his election campaign; Carey was never found guilty of any crime. 24. Nick Wingfield, “Amazon Proves Infertile Soil for Unions, So Far,” New York Times, May 16, 2016. 26. Guy Standing, The Precariat: The New Dangerous Class (New York: Bloomsbury, 2014), passim. 27. David Weil, The Fissured Workplace: Why Work Became So Bad for So Many and What Can Be Done to Improve It (Cambridge, Mass. : Harvard University Press, 2014), passim. 28. Wayne Lewchuk, “Precarious jobs: Where are they, and how do they affect well-being?” The Economic and Labour Relations Review (Vol. 28(3), 2017), 402–419. 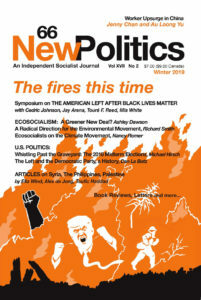 Dan La Botz is a co-editor of New Politics and the author of several books about labor, social movements, and politics.